Jack McLaughlin began his career in 1953 at Scarboro Golf & Country Club, and also served as Head Professional at Cedar Brae Golf & Country Club and Bayview Golf & Country Club before relocating to Vancouver’s Shaughnessy Golf & Country Club in 1974. McLaughlin also served as President of both the Ontario and British Columbia PGA boards, as well as Director of the PGA of Canada. Dedicated to Junior Golf and Teaching, he coached many of Canada’s top players including Lorie Kane, Ray Stewart and Brent Franklin. McLaughlin is also remembered for his commitment to the game, developing junior programs and serving as the National Junior Committee Chair for the PGA of Canada. 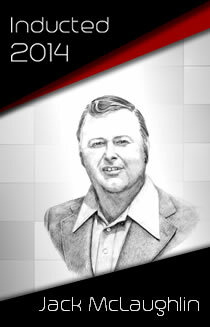 Jack was inducted into the Canadian Golf Hall of Fame in 2013.